They may be just props, but I like it. I’m particularly fond of women with intelligence. A sharp wit, a cutting intellect… what’s not to like? As far as physical attributes are concerned, curly hair and a cheeky smile are pretty much at the top of the list. And so I found myself sitting down to watch ‘Canberra Confidential‘ on Channel 2 (Australia’s government funded television body – the ABC), which was being hosted by one of my favorite political writers – Annabel Crabb. She’s always offered some very considered and thoughtful political commentary, and has some great curly hair and a very warm smile. The show was great. It delved into some of the more bizarre back room (and often lounge room) historical goings on in our political capital – and was worth the watch. Even if it was more along the lines of entertainment, than political discussion. But hey… with a title like ‘Canberra Confidential’, what more did you expect? I just wish there was more of it! So, I’m guilty… I enjoyed the show. 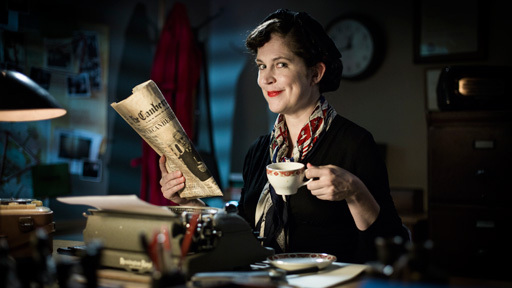 And I enjoyed it all the more for seeing Annabel Crabb sitting behind a great looking Remington 5 typewriter, along with some great Deco era decor. Gear that I’d feel right at home at. Is it wrong to find this…. visually appealing? And while we’re at it. Is this Remington one of Rob Messengers? I mean… he was local after all. The typewriter. Not Annebel Crabb. 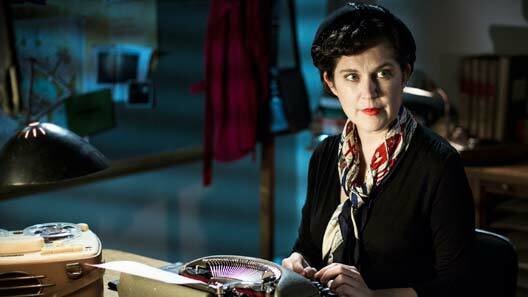 March 23, 2013 in Annabel Crabb, Canberra Confidential., politics, Remington 5, typewriter. The road to Gundagai, and unexpected rarities. ← A little spot of spotting! What great photos even if it is staged. It captures the era great. I like the first photo where she seems quite enjoying her work and the close-ups of the typewriter and tape recorder in the second. Looks like someone had fun setting that up. Good find. I thought you might spot the tape recorder. Beautiful, isn't it?! Absolutely. I would love to know if they are regular ABC TV props, or they organized them from elsewhere.